Phone *Please no spaces or dashes. If you own a home, you likely understand the crucial role that gutters play in keeping it protected. Not only does your gutter system channel snowmelt and rainwater away from the foundation where it can cause extensive damage, it also helps prevent water from collecting on the roof, in the eaves, and all along the exterior. 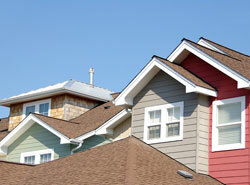 Today, gutters are more advanced and easier to maintain than ever before. And, while they still perform the same basic function, new gutter systems have been devised that solve many of the problems associated with older designs, namely leaks, ice buildup, and clogging by leaves, twigs, and other forms of debris. At The Board Store Home Improvements, we install cutting-edge seamless gutters and gutter protection products that give homeowners everything they truly need. If you simply dread cleaning out your gutters every season, our gutter guard system is an ideal solution as it lets rain in and keeps leaves out. Plus, the home improvement experts at The Board Store Home Improvements have many years of experience in gutter installation and will ensure that the new gutters you buy for your home work precisely as they were designed to. Contact us today to learn more about our many outstanding home improvement products. Whether you live in La Crosse, Onalaska, Winona, Westby, or Viroqua, The Board Store Home Improvements is a reputable local home improvement company you can turn to for expertly installed gutters, windows, entry doors, insulation, and more. Improving your home, improving your life!